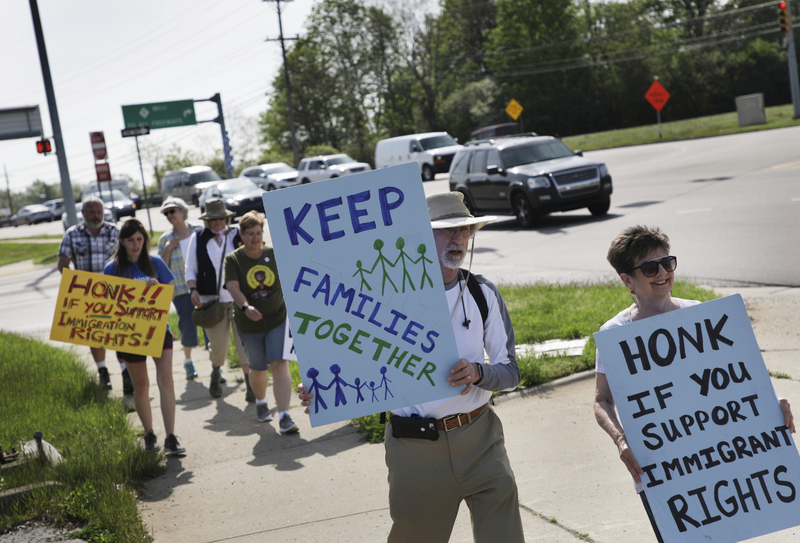 DETROIT (AP) — A group of immigrant advocates is walking from Detroit to Lansing to bring attention to an Albanian man seeking sanctuary in a Detroit church. The 90-mile journey started Monday at Central United Methodist Church in Detroit, where 48-year-old Ded Rranxburgaj has taken refuge since January. Rranxburgaj, who has no criminal record, is facing an order for removal after his legal status expired. Rranxburgaj came to the U.S. with his wife 17 years ago. He said he was granted temporary humanitarian status after his wife was diagnosed with multiple sclerosis more than a decade ago. His wife depends on his care. Congregation members, immigrant families and others are marching in hopes of securing a stay for Rranxburgaj from U.S. Immigration and Customs Enforcement. The protesters are expected to arrive at the state Capitol by Tuesday. “This pilgrimage is about educating people about the broken immigration system and specifically shining the light on the Rranxburgaj family and their plight,” said the Rev. Jill Hardt Zundel, Central United’s pastor. Zundel said that every time she feels tired along the route, she remembers that Rranxburgaj can’t walk outside of her church out of fear that immigration agents will arrest him. ICE spokesman Khaalid Walls has said that Rranxburgaj currently is considered a fugitive after not reporting to ICE as instructed in October. President Donald Trump’s administration has cracked down on illegal immigration since he took office. The number of arrests of immigrants without criminal records that are living in the U.S. illegally has spiked in Michigan and Ohio, according to the Detroit Free Press. Protesters are holding another walk at the same time from Kalamazoo to Lansing for a Pakistani immigrant facing a deportation order, Saheeda Perveen Nadeem. She’s also in sanctuary at a Kalamazoo church.